After you’ve patted dry each slice, bring the vinegar to a boil in a saucepan and cook the mushrooms for several minutes. The slices will float to the surface, so use something like a potato masher or other tool to keep them submerged in the vinegar. Strain the mushrooms (save the vinegar for something else, like dressing) and blot the slices with paper towels to soak up as much excess liquid as possible. Again, if you have cuts on your hands, disposable gloves will save you from guaranteed pain. 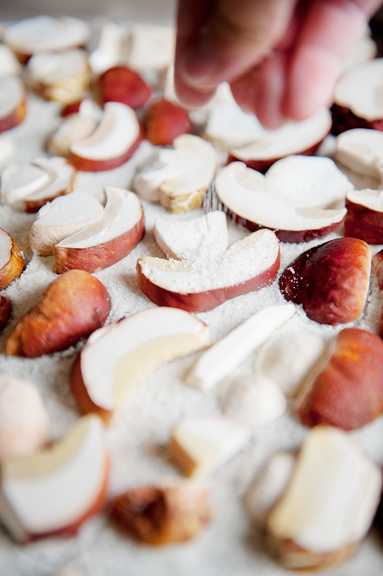 Lay the mushrooms out to dry for 12-24 hours. They should be pliable, but no longer damp when they are ready. 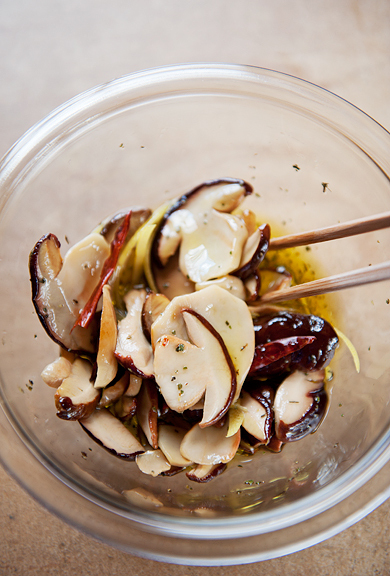 Combine the mushrooms with the chili, oregano, lemon zest, and olive oil, tossing them together. Place them in a glass jar and gently tap the bottom of the jar on a kitchen towel on the counter or table to release any air bubbles. For the really stubborn bubbles, you can get those using a chopstick or other skinny, pointy implement. Be sure that all of your mushroom slices are covered in oil. 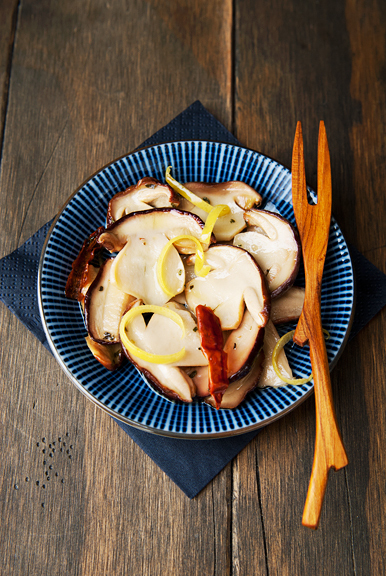 Though you may be tempted to take a taste, give the mushrooms at least a week in the refrigerator before serving and store them for up to 6 months. The end result is something so addictive that you will never have made enough. For that reason, you shouldn’t sit down in front of the television and polish off a jar like you would with dill pickles. These should be savored on special occasions, snuck out of the jar at midnight, and reserved for only the most worthy of recipients. 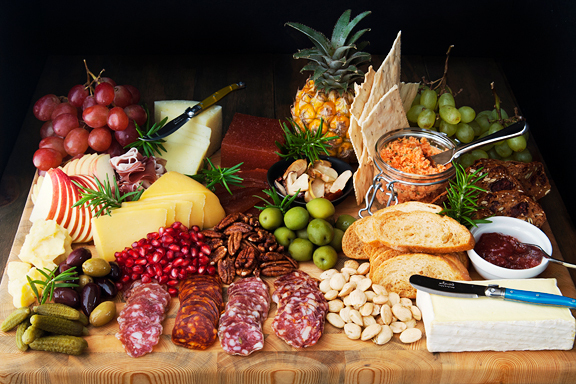 Meaty, chewy, tangy, floral, bright, spicy, salty, earthy. 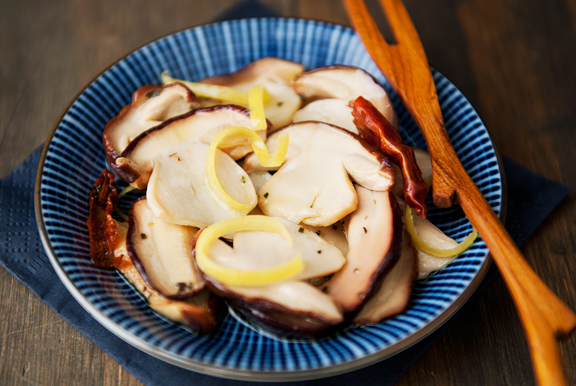 This Italian marinated porcini is beyond any marinated mushroom I’ve had before and I cannot wait to make more this season. 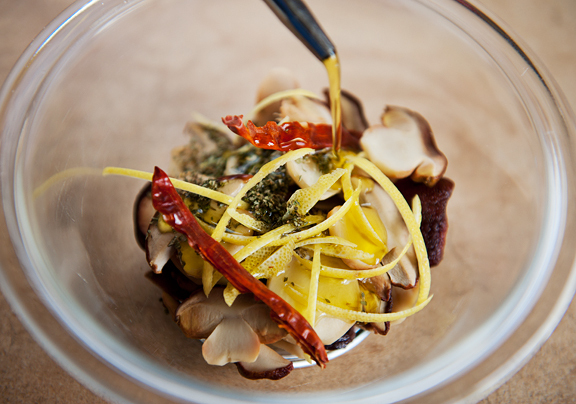 *Remove the pores from the mushroom if they are yellow or pliable because they can become slimy during the pickling process. 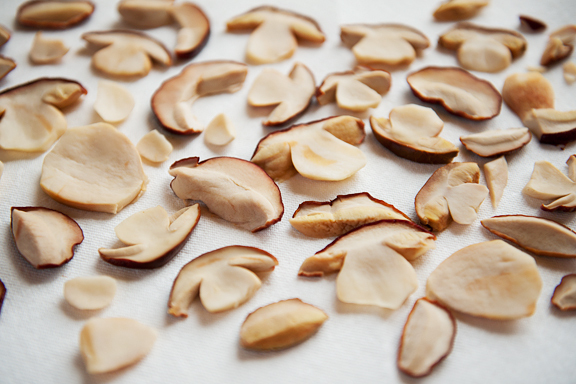 You can dry any discarded pores and grind them into a powder – which makes a wonderful seasoning. If the pores are firm and light or cream colored, as in with smaller/younger porcini, I leave them intact. 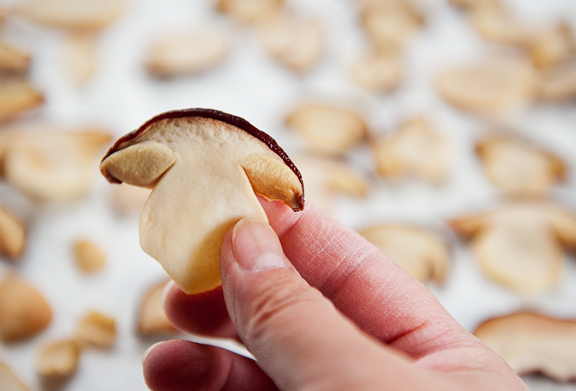 Slice the fresh porcini into 1/2-inch thick pieces. 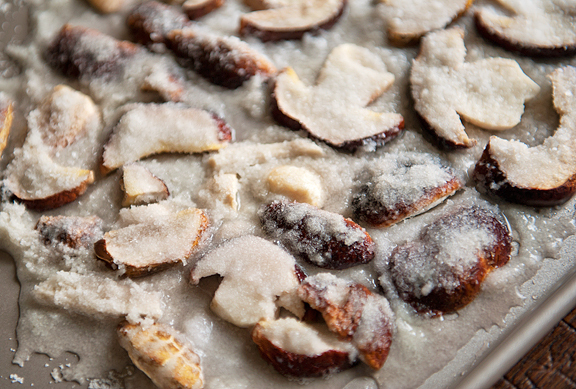 Spread a layer of salt on a large baking sheet. 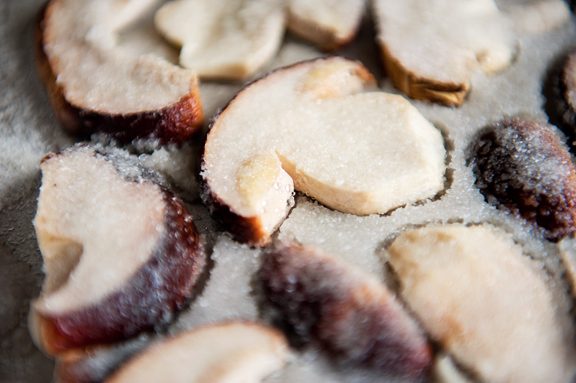 Arrange the mushrooms slices (cut-side down if one side is uncut) in a single layer on the salt. Sprinkle a generous layer of salt on top of the mushroom slices and let the salt draw the liquid out of the mushrooms for an hour or two. 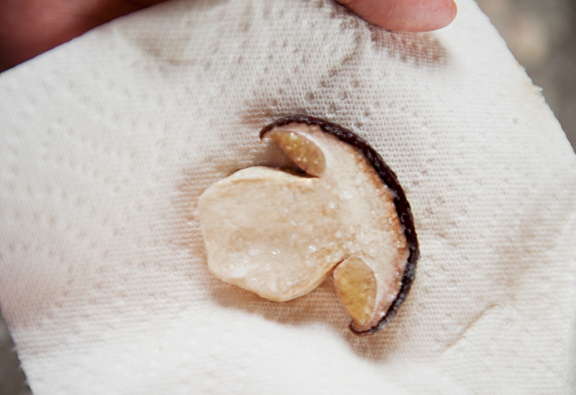 Press the mushroom slices between paper towels to remove excess liquid. 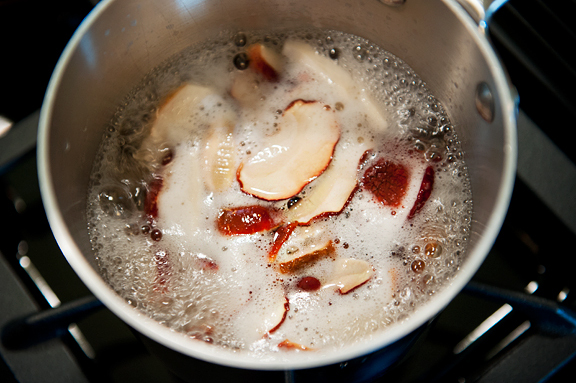 Bring the vinegar to a boil in a small saucepan. 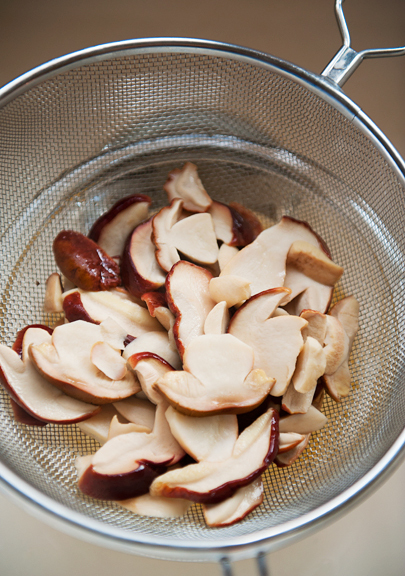 Boil the mushrooms for 5 minutes, submerging the pieces with a potato masher or a skimmer if you can. Remove the pan from the heat and strain out the mushrooms. 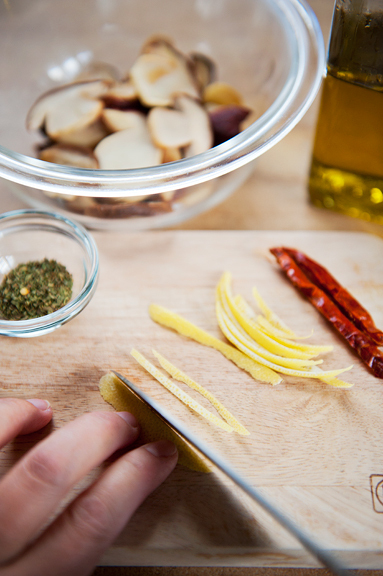 You can reserve the vinegar for other uses like dressings. 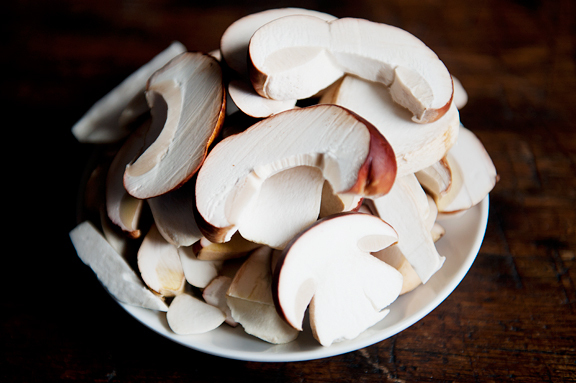 Carefully blot the mushrooms with paper towels. Lay the slices in a single layer on a cloth or paper towels to dry, about 12-24 hours, turning once or twice. They are ready when they are no longer damp, but are still easy to bend. 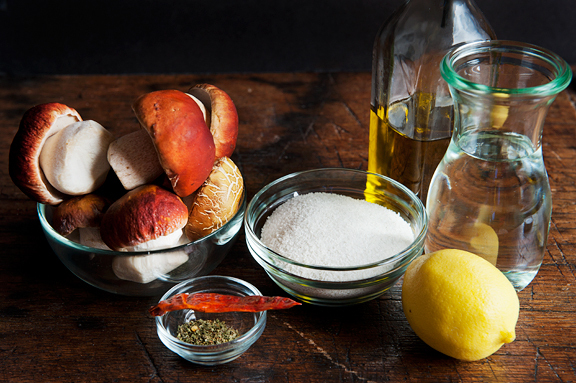 Add the oil, lemon zest, oregano, chile, and mushrooms to a bowl. 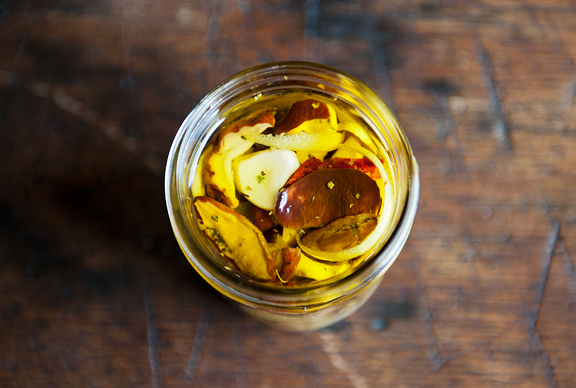 Toss everything together and pack into a jar. Use a skinny knife or chopstick to release air bubbles from the jar. Be sure the mushrooms are completely covered by the oil. Refrigerate for at least a week before eating. Store for up to 6 months in the refrigerator. Makes 1 pint. As I read this I thought of a children’s story, and how Yuki and Neva could become just that. Your perception of Yuki’s needs and Neva’s ability to lead by example are such great life lessons. Love it!!! I am loving the Neva and Yuki stories, and I think Jill is absolutely correct! The way they have helped each other is inspiring! Your recounting of your family interactions brought tears to my eyes this morning. Thank you for sharing your “life & times” with all of us, and in such an artful & poetic fashion. 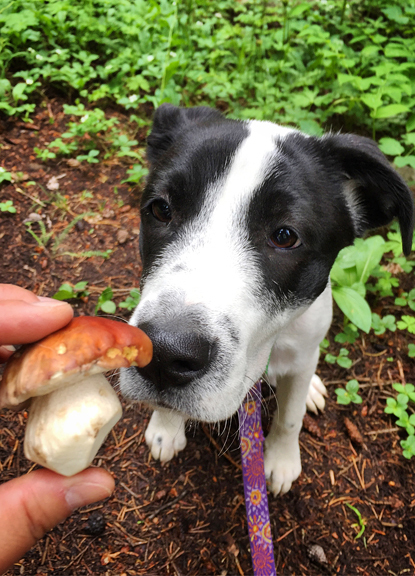 The trust, the caring, the learning and above all the love is so evident and inspiring in all that you undertake…whether it be doggie training or in your culinary pursuits! 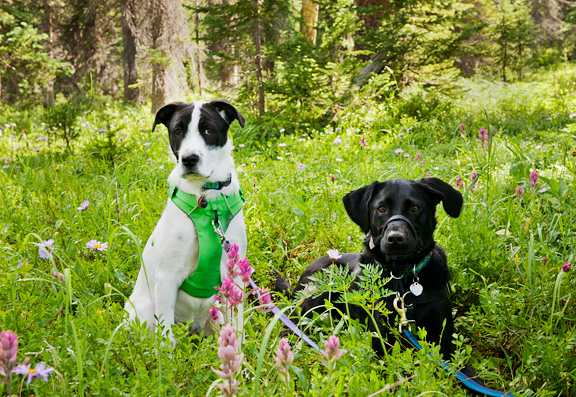 Dogs are so helpful to each other. They communicate with each other in ways we cannot. The message gets across so much more quickly when it goes from dog to dog. 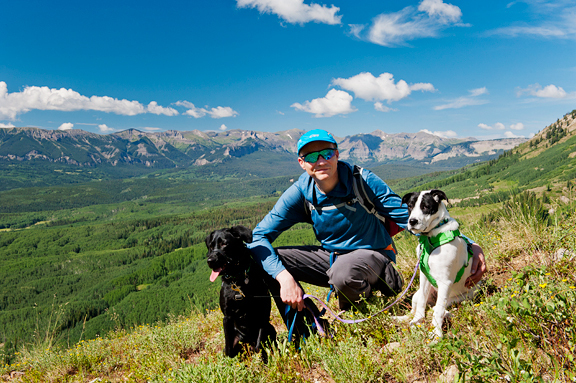 Equally important is a human who allows the dogs to communicate and help one another!! Those porcini……wow. I love these doggie stories! I cannot get enough of these two beautiful girls! I love how they are ‘helping’ each other. I love your recipes too, but who am I kidding, I’m really here to see those 2 cute puppy faces. Makes me want a second pup! I love hearing about these two little girls and I am so happy to hear they have such a wonderful relationship! Porcinis look beautiful! Do you think these could be processed in a water bath for longer shelf life? Kristin - It really is, and I'm just so happy to witness it! 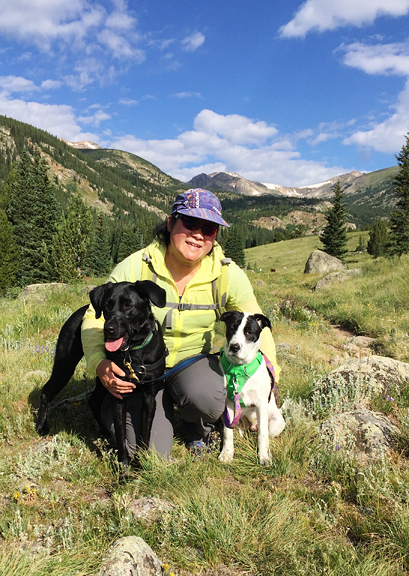 Heather - Sometimes I think a second pup was the best decision we ever made. Mary - I don't know as I haven't tried it before. 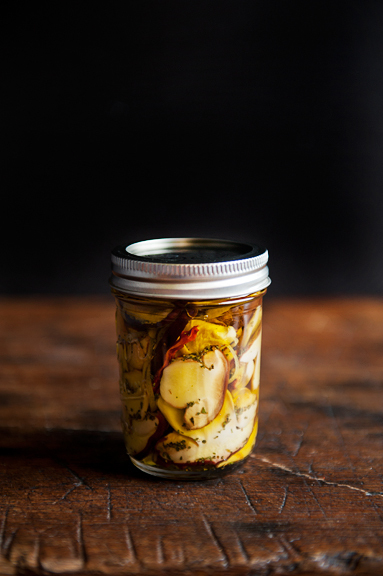 But certainly people have canned marinated mushrooms in oil before, right? I guess the one thing to consider is garlic in oil (is there something about botulism to concern ourselves with?). Maybe ask Hank Shaw? I had to look up “stable goat: too. What a neat interaction! It’s been raining cats and dogs on the east coast for weeks, and I thought of you as I was pulling into a parking lot in eastern Carolina last weekend. There were these BEAUTIFUL mushrooms, that looked just like porcini growing in a flower bed in a parking lot! tons of ’em I tell’s ya! I had to LOL because at first glance your like “omg, porcini mushrooms!” and on second thought your like “omg, those are poisonous!” (no joke, if you don’t know what your doing, please do not eat wild mushrooms if you are not taught how to identify them). But nonetheless, the photo would have been priceless.